This is a collection of the maps and analysis that was conducted for both ENVS 420 and ENVS 421 at Western Washington University. These two classes are ENVS 420 (GIS III - Analysis and Modeling) and ENVS 421 (Advanced GIS Applications). Click “Learn More” to find out more about any of the maps. This project involved two steps. The first was developing a data collection strategy and the development of an appropriate geodatabase. The next step was to collect the data from all the other data collectors and analyze it in order to create a raster feature that displays the collected data. Survey data for various locations around the Western Washington University campus. Information collected was a subjective analysis for both safety and noise and was used to develop a raster layer displaying noise or safety data. The result of the previous survey and data collection process. This component involved the development of maps and a surface raster layer with which to show the resulting subjective noise and safety ratings for over 400 points around the Western Washington University campus. Model and analysis of Stillaguamish River watershed, sub-watersheds, and catchments. This analysis was conducted in order to discern to density of road crossings on the streams within the watershed. This will help prioritize restoration efforts and limit the sedimentation within the watershed. These results were then published on a story map here. 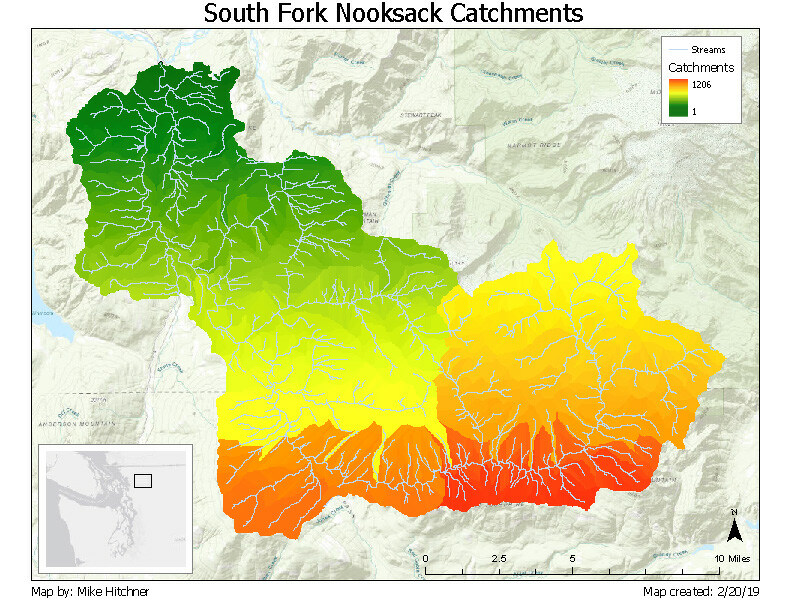 Hydrological analysis of South Fork Nooksack watershed, sub-watersheds, and catchments. An examination of road crossings of streams and rivers in Whatcom County. Visualization of area that is expected to receive 1cm of ash fall in the event of a Yellowstone Caldera eruption. Analysis of vulnerable populations and their proximity and exposure to hazardous sites in King County. Analysis of potential routes through the North Cascades using least cost analysis based on slope and proximity to streams and rivers. An analysis of current and future climate envelopes for the Sitka Spruce in western North America.